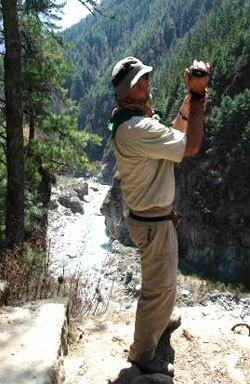 Last Trek Report – Everest, April 2008 - Trekking in Nepal with Teresa, Slow Trekking for peoples of all ages. 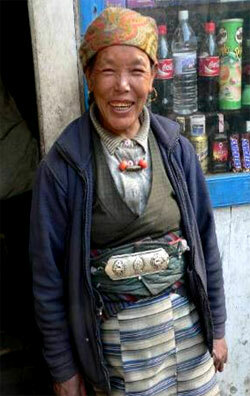 Larraine was the first to arrive in Kathmandu, so early that she attended the wrap dinner for the Kali Gandaki group. She joined Robyn for a day-trip to Bhaktapur while I collected Eric. Hadn’t seen him since late January so it was a lovely reunion. Anna, Lee and Cass arrive early too, giving themselves plenty of shopping time. Next day, Adrian and Christina arrived early on Gulf from UK, then Margaret and Michael with Peter and Lici, from Australia. Only Sue left, but that meant it was back to the airport for me the next day. Meanwhile the clients started shopping. They were unstoppable. Cass is definitely the Bling Queen but tiny Anna looked good in some chunky Nepali jewellery. After a rather frantic day of shopping for gear and changing money – it takes a while with eleven clients – we were ready for a very early flight to Lukla. Well, some of us were a bit more ready than others! It was a good, clear flight that had everyone gasping as we approached the tiny strip at Lukla, 2800 metres. The very attractive lady co-pilot was a delightful distraction for some. A slow breakfast at the Sunny Garden gave us time to round up the porters. This is our biggest group ever to Everest so there were a few new faces. 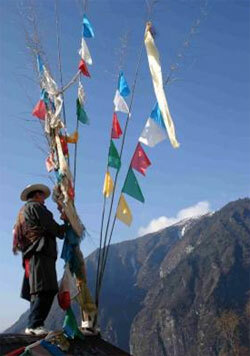 Our first day to Phakding was fairly easy and many of the fitter members had showered by the time I arrived. Next morning early quite a number went over to the old Gompa, across the valley prior to departure. Those of us who didn’t, really enjoyed a relaxing cuppa in the morning sunshine on the dining terrace. There are a lot of very interesting things passing by in this region – porters, horses, dzopke, farmers with primitive tools but …..no yaks yet! edge gave Lahar a chance as the cry of ‘CATCH IT’ went up. It was very low, the catch went down and, moments later, so did Lahar’s trousers. Split right up the middle. At 3400 metres our hysterical fits of laughter left us gasping for air. We needed tea at the shack outside Namche just to make it up into the village. Our host, Dillip is unchanged, quite literally; he’s been wearing the same yellow POLO shirt for five years now. We did the lookout walk early next morning. Not perfectly clear but still impressive. From this ridge, just twenty minutes above the village, the really big peaks are all lined up. Nothing quite like the thrill of seeing that great ‘tor’ of Ama Dablam appear over the ridge. Thamserku was closer and clearer than the others with its distinctive notched ‘v’ in the middle. But it’s the huge wall of Lhotse Shar with Everest ‘peaking’ over the top that really gets your blood racing. Shutterbugs paradise. The museum is much improved too. Breakfast afterwards was welcome. Even short walks at this altitude can wear you out; and it’s always steep up and steep down. At eleven we sent the Base Campers on their way. Cass, Lee and Anna, Adrian and Mike looked like they meant business and I had no doubt they would succeed – or have a dam good time trying. I knew Dorje would take good care of them too. Margaret, Peter, Lici, Eric and I headed out to Thamo for a day-walk. The weather fought back long before we reached Thamo but it was a lovely, easy kind of walk, a bit off the main trail. 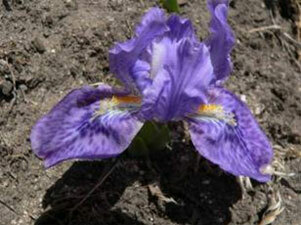 Interesting spring flora and fauna too. Interesting sights on the way to Thamo. Back in town the news is that the Maoists have won the election, The porters are glued to the television. Peaceful in Kathmandu so far. Good news. Our walk to Kangzuma was good. Not perfectly clear but tantalising glimpses of Everest again, and Ama Dablam showed itself magnificently as the sun set. Ang Tashi and Lagpa as cheerful as ever and their pet yak was a hit. Cold enough for fleece liners in sleeping bags tonight but the hot steamy dining room was cosy. Fabulous morning with clear peaks right in front of us and an air of anticipation as we set off steeply downhill to Phunki Tenga. Fortified by a good cuppa we climbed the hill to Thangboche. This ancient monastery was burned down about 20 years ago but has been rebuilt to look exactly the same. We planned to have a more thorough look at the gompa on the way back down It was a tough climb but we just plodded along and kept encouraging each other. The view up the glacier to Kang Tenga kept us going. The lodge at Devouche is the real thing. Rooms like cupboards, and the dining room was not much bigger. Found 20 Americans meditating down there at afternoon tea time – most disconcerting! Had a little dance party of our own later. Some of our porters can really sing and Lahar has always got the good moves on the dance floor. A bit hot dancing round the stove! Christina could see Everest from her room. 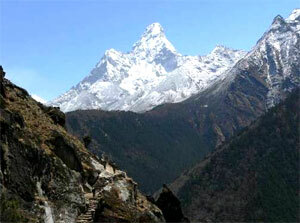 The next day was hard but the view of Ama Dablam, which is quite close when you are at Pangboche, was exquisite. Everest, with its classic plume of cloud showed itself over the Lhotse ridge right up until we climbed too close to see it. It’s quite a long way to Dingboche and takes us to 4350m. That’s high! Very happy to see the lodge, but it seems to take forever to get there once you can see the village. I collapsed in a heap that night but, even feeling badly, I could look out of the windows and marvel at our location. Next morning most of us set out for Chukung. It was a struggle. The lack of oxygen seems to make you feel a hundred kilos heavier than you are. The tea stop at Bibre was as far as I could go and we had already lost Eric along the way. In the end, only Lici made it to the top. Well done girl! The stunning views of Lhotse ridge, with a little cloud gathering around the tops as we walked, will stay with me forever. (see first picture). It was hard going, but I think we all got our money’s worth. Walking downhill after a big climb always feels great. There is lightness in your step that makes you feel inexplicably happy. Oxygen my friends, it really does cheer you up. Some of our members visited the monastery at Thangboche, with Mangal as guide; one of the customers on a previous trek nick-named him ‘guru’. He knows his stuff. After plates of golden chips at the bakery in Thangboche, possibly the most scenic, we tripped lightly down the endless dirt track back to the river at Phunki Tenga. Everyone marvelled on the way down at what they had climbed. Our lodge at Phunki Tenga is a bit basic; it has a few nice rooms but you have to be early to get one. A fine meal emerged from the basic kitchen. I like this lodge. You can hear the sound of the river at night, and the breeze in the pines. 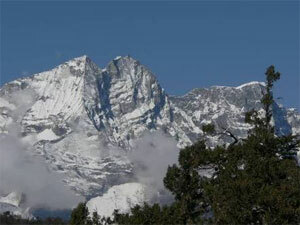 Snowed overnight – just enough to dust the peaks. Our climb back up to Kumjung was slow at first. Being shaded in the pine forest helped keep us cool, but it’s still uphill, extremely so. 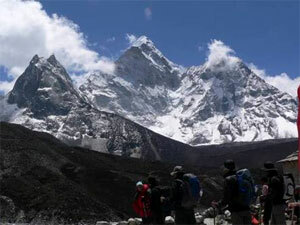 Lunch is back at the Ama Dablam lodge in Kangzuma – a really long, long lunch. It is hard to tear yourself away from this view and pheasants were spotted in the paddock. We climbed the short-cut to Kumjung and delighted in the big, wide soft beds in our lodge. 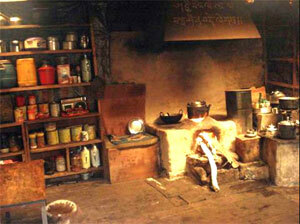 Traditional Sherpa dining room and bathrooms with white tiles and flushing toilets had everyone in a good mood. Funny how these things matter more as the trek wears on. The clear weather is still with us and the sunset on Kwangde and Thamserku from our village was lovely. Kumjung really is a little Shangri La. Next morning we took in the gompa, complete with a look at the ‘yeti skull’ and the Hilary clinic and school Sheru (art teacher) gave me a picture of Sherpa woman, thanks mate! They really feel the loss of Sir Ed here. After the bone-crunching descent from Shyangboche airstrip (where we got one more view of Everest) into Namche, all we could do was wait for the Base Campers to return. We had heard that they were on their way into town. A vast pot of hot chocolate helped, but it was a long wait. Scanning the various trails into town periodically with binoculars was useless. Finally, with a lot of hootin’ and hollerin’ there they were. Lean, brown and grinning from ear to ear. All made it, all happy, all ok. Yes! Fab dinner that night. Could not shut the Base Campers up. 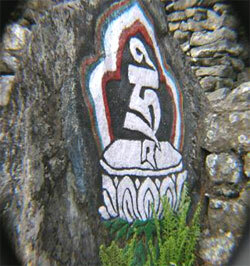 Kala Pattar this and Base Camp that. Oh, it was so-o-o-o-o tough here and so-o-o-o-o-o cold there. Yes, well done guys. Husbands and wives were pleased to be reunited and there had even been A PROPOSAL! That was a new one. Lee had actually got down on one knee, in the freezing cold, and asked Anna ‘the big question’. Of course she said ‘YES’, So romantic! The walk back to Phakding was great. 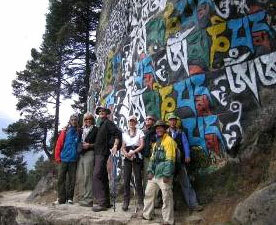 Said goodbye to Everest and made a group photo at the Chautara halfway down the ‘big hill’. It’s spring so everything is growing like topsy. Rhododendrons are especially good this year and we could smell Daphne long before we could see it. New calves and puppies and babies EVERYWHERE. Saw the beehives on the cliffs and two beautiful lampuchre (longtails) flew across the trail right in front of Lici, Eric and I. The wheat is a foot higher after just two weeks. Back in Phakding, after calling an extraordinary meeting of the Phakding Rotarians, at which Base Campers were offered, and rejected, honorary membership, a few rum and cokes were cracked and EVERYONE, and I mean EVERYONE, danced. There is a certain kind of friendship that you make with people who sweat and curse and try hard alongside you for a while. I certainly felt very connected to this little posse. We may not have conquered Everest itself but we certainly had a few tough times where we needed each other’s support. We did it together. Thanks, you were a super group. Sorry to leave it all behind. Easy walking to Lukla and a nice cuppa at Hem’s house then an even nicer one at Bir’s house put us all in a good mood for the evening. We raffled off all the unwanted gear. Somehow, everyone got what they needed - or traded it afterwards. Some boozy dancing to Bob Marley (traditional trekking music) then a fairly early night in anticipation of a very early departure. Sad to leave our boys behind. The ones who made it all possible. Mangal, Dorje and Lahar came on the flight with us but we left behind Bir, Bishal, Akal, Subash, Hem, Kancha, Changba, Nanda, and Purba. Hope they are all doing ok. I hear Dorje is arriving in Melbourne around 18 June. Lici on 5276 1453 has details. Kathmandu was a blur of shopping and sightseeing. I think everyone ended up getting what they wanted. Visiting the library project was a highlight and thanks to Netra for keeping that airport transport happening. Sue tells me that she has recovered. 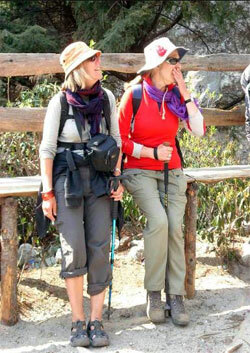 She loved catching up with Jo in Kathmandu again (their trek went really well too). In fact, they are having lunch with Christina and Adrian in London on the weekend! Larraine delivered the painting to my mum in Perth. I had no idea I had forgotten Mothers Day; the timing was a fluke. Thank you. I am holding off sending this report out till tomorrow in anticipation of getting some summit photos…….. Maybe not. I will update the report if and when I get some pictures. Till then, get in touch if you fancy coming with us next time.